Live Agent – What is it? Live Agent enables real-time, online chat between an organisation and its customers, prospects etc. The chat sessions can be initiated via clicking a button or link on a web page, or via automated invitation based on page access metrics etc. For the end user, it can be very convenient to resolve a query through chat, avoiding the usual frustrations of calling a support line – although the end-user experience is still very dependent on the skill and knowledge of the receiving agent. For the organisation, there’s huge potential for call deflection – an expert team efficiently managing multiple concurrent chats (routed by skill) can hugely impact on the call volume. The handling cost of a chat session is generally perceived to be 1 third of the cost of a phone call. Theoretically therefore we have a win-win situation, online chat should be good for all parties. The double digit percentage increase in the use of chat year-on-year (according to Analysts) is evidence of this. Analysts are also predicting strong growth in live video chat for customer service, with B2C chat options such as Amazon’s Mayday button, becoming mainstream. 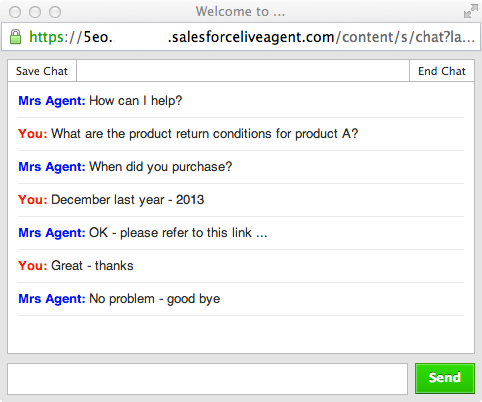 Salesforce Live Agent was introduced onto the platform in the Spring 12 release following the acquisition of Activa Live Chat in September 2010. 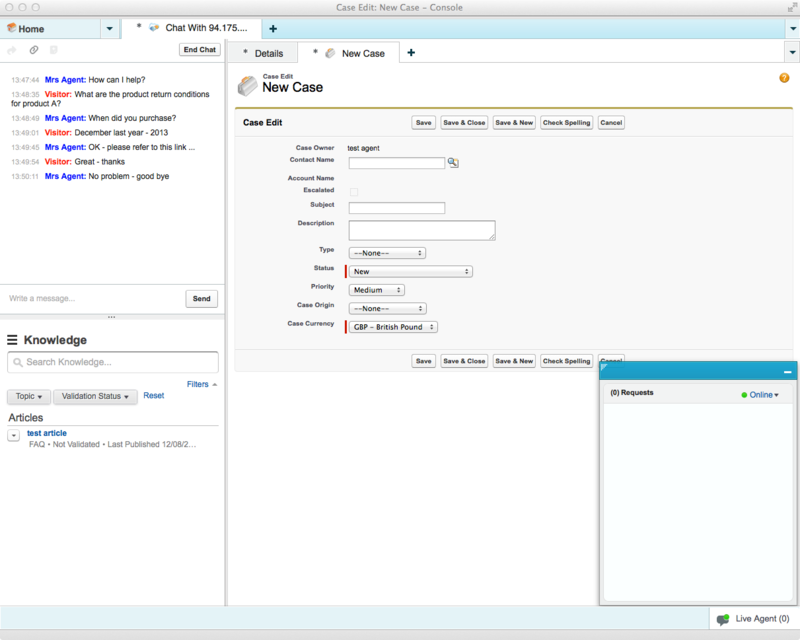 A Configuration defines the behaviour and presentation of Live Agent with a Salesforce console. Configurations define the number of maximum active chats, the welcome greeting, sound notifications on various events, supervisor monitoring settings and skills-based chat transfer options. Configurations are assigned to Users and/or User Profiles and are typically defined with separate configurations for for standard chat users and for supervisors. A Deployment defines the behaviour and presentation of Live Agent to the end-user, i.e. customer or prospect. Deployments control the look and feel of the Chat windows displayed, plus options for the saving of transcripts. Multiple deployments may be configured across product lines or host web sites. Note – each deployment generates a snippet of HTML which should be inserted once into the host page. The referenced endpoint is unique to the Live Agent org and is generated (and displayed) when Live Agent is enabled. Skills play a key role in routing incoming chats to appropriate agents. In short, multiple skills can be defined (“General Enquiry”, “Product A Enquiry” etc.) and assigned to Users and/or User Profiles. Every inbound chat is related (via the button) to one or more skill. A Chat Button defines the entry point for a chat and also key information relating to routing such as skills required, queuing options and routing type. The routing type can be set to Least Active, Most Available or Choice. Buttons can be fully customised and branded and be set to display pre-chat forms or post-chat pages. Note – each Chat Button generates a snippet of HTML which should be inserted into the host page. In principle Automated Invitations work the same way as a Chat Button, however the chat session initiation occurs via a proactive invitation based on defined sending rules (Seconds on Page, Seconds on Site, Page Views, Url Match, Custom Variable). Live Agent appears as a Channel for predefined Quick Text messages. Such message can be easily inserted into the Chat conversation, for agent convenience and standardisation of messaging. To do the character sequence ;; must entered into the chat text input, this will trigger a list of most recently used messages to appear, alternatively additional characters after the ;; will result in a filtered view. Not an ideal user experience as the agent must be familiar with the message naming. The now retired, standalone version of Live Agent console (flash based) had stronger functionality in this area – enabling messages to found by category. Introduce a pre-chat data capture that could be used for routing, mapping and auto-query. Mapping relates to mapping page inputs to record attributes in Salesforce. Auto-query relates to records automatically opening when a chat is accepted e.g. the contact record for the customer – or perhaps a transactional record such as an invoice, purchase, booking etc. In addition to record search, record creation is also supported e.g. create a contact record if no match exists. Information entered into the pre-chat form can be viewed by the agent before and during the chat session. Standard Live Agent Visualforce components can be used to build completely custom chat windows. Finish the chat session with a page displaying a summary, useful links etc. REST resources that enable a custom chat experience to be developed using any programming language or technology capable of addressing a RESTful web service. Exemplar use cases for this API are custom mobile application development and integration of chat functionality into an existing application. Note, each org enabled for Live Agent exposes a unique Live Agent API endpoint. There is also a Suggested Articles from Chat feature in the Salesforce Console configuration which I assumed would search Salesforce Knowledge based on the Chat text – it seems that all this does is add Knowledge to the Live Agent sidebar. Note – Live Agent is also available in Developer Edition.